Amid high optimism on US-China trade talk progress, markets are seeing a large upswing this afternoon. Crude oil is currently trading at $53.80. 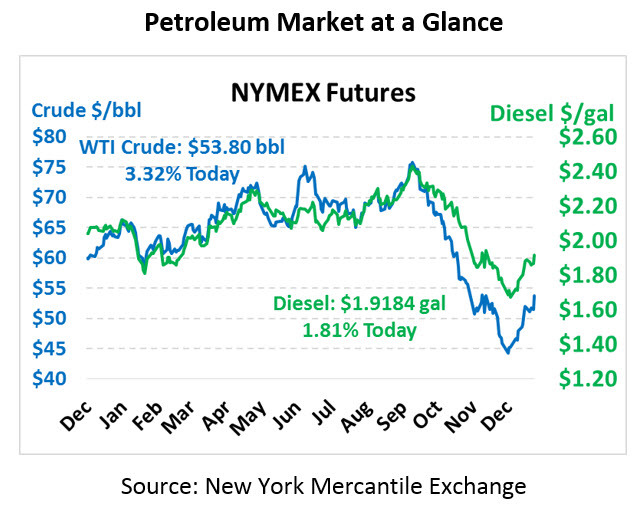 Fuel prices are taking part in the rally as well, with both diesel and gasoline prices rising to multi-week highs. 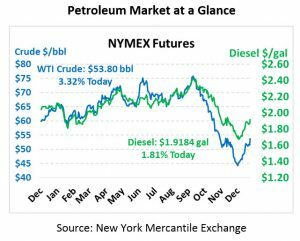 Diesel prices are currently trading at $1.9184, up 3.4 cents. Gasoline prices are at $1.4497, up 2 cents from Thursday’s close. The Chinese have offered to reduce the US-China trade deficit to $0 by 2024, according to Chinese sources. Although talks continue, balancing the trade deficit has been a key goal promoted by President Trump during these negotiations. The US government shutdown has delayed talks between the two countries, but markets are responding positively to the announcement. Of course, for China to buy more from the US, they’ll need to buy less from other countries, potentially exacerbating concerns about developing economy growth. On the supply side, OPEC and Russian officials have been reporting this week that they are on track to meet production quotas for January. The OPEC+ nations agreed to cut output by 1.2 MMbpd in 2019, whittling down some of the supply glut seen later in 2018. Compliance is a significant question for markets – OPEC was lax in the latter half of 2018 on their quotas, causing prices to fall. If they stick more closely to their commitment, oil prices ought to rise in response.